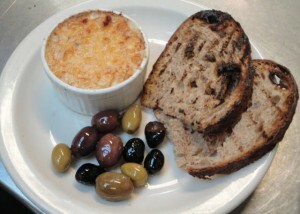 Brandade de morue is a salt cod dish from the French Mediterranean coast. This very traditional preparation involves gently simmering the salt cod in milk, then mixing it with garlic, olive oil and cream. We add a bit of potato to the mixture (a particularity that comes from the Provençal city of Nîmes, which accounts for the name of our version), then gratinée the top of the puree with a bit of grated Parmesan cheese and serve it hot with grilled country bread and marinated olives. Brandade Nîmoise is on the menu at Le Pichet and Cafe Presse seasonally, generally during the cold months of winter; it is a hearty, warming dish. Rinse the salt cod under cold running water. Soak the cod in a lot of cold water for 2-3 days, change the water daily. Peel and half the carrots and onions. Peel the garlic clove and remove the germ. Drain the cod filets, then put them into a pan large enough to hold them easily. Add the carrot, onion, garlic, thyme sprigs, and bay leaves. Add enough milk to cover the filets completely. Put a cloth napkin on the surface of the milk to insure that the salt cod will remain submerged during cooking. Bring to a boil, then reduce the heat to a simmer and continue cooking slowly until the cod is very tender (this will take about 15 minutes). While the cod is cooking, peel and quarter the potatoes. then boil in unsalted water until they are soft as for making mashed potatoes. Drain the potatoes, then dry them in a medium oven on a sheet pan for 5 minutes to remove more of the water. Pass the potatoes through a food mill and hold them in a warm place while the cod cooks. Warm the cream and olive oil in separate pans over very low heat until they are just hot to the touch...do not boil. Drain the cod, discarding the milk, onions, carrots and herbs. Put the cod and the cooked garlic into the mixing bowl of a stand mixer fitted with the paddle attachment. Stem and chop the thyme for finishing. Finely chop the garlic for finishing. Add thyme and garlic to the brandade to taste. Put the brandade into a baking dish, spread it level the top and then sprinkle with the grated Parmesan. Bake the brandade under the broiler until the top is golden brown. Serve immediately with grilled country bread and marinated olives. This entry was posted in Savory Dishes and tagged Fish. Bookmark the permalink. It seems such a waste to discard the milk, I used it to make a fisherman’s pie and thickened it with a roux and added smoked haddock, prawns and fresh cod folded in and baked it with mash on the top. A British classic and a French classic 2 for 1 if you will. I had not tried that as I am generally afraid that the milk will be too salty…good idea!